Personalised Hand Painted Pottery Gifts. 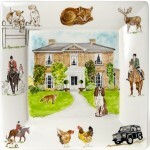 Message plates and Hand-Painted Personalised Pottery Gifts by Ceramics Artist and Illustrator Elizabeth Clark. Signature Plates are the brilliant alternative to an ordinary guest book. Ask your guests to sign and write their messages of love using a special signing pen onto a fabulous hand-painted signing plate. These lovingly painted personalised autograph plates make fantastic keepsakes and are a wonderful reminder of a special day. Ceramic Gifts. Montage or Memory Plates, Teapots or Biscuit Barrels. These are unique hand painted and illustrated pottery pieces, that celebrate, significant, events, people, places, and things. The central illustration is usually a home and garden or a family scene. The surrounding illustrations are symbolic of events, places and things. These are unique to Elizabeth Clark Designs. They make popular 9th Wedding Anniversary Gifts. Also birthday's, weddings, retirements and other celebrations. Hand painted personalised clock's, pates and picture frames to celebrate christenings or naming days or Baby Births. 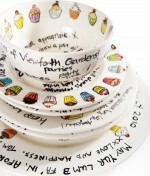 Each piece of pottery is hand painted and illustrated by Elizabeth and professionally kiln fired. 9th WEDDING ANNIVERSARY GIFT IS POTTERY. To Celebrate your 9th Wedding Anniversary commission ceramics artist and illustrator Elizabeth Clark to hand-paint a Montage or Memory Plate. These unique plates are designed to feature significant and special events of your 9 years of married life together. A 33cm Square Rimmed Plate is £215. This cost includes the plate, the design, the hand-painting and illustrations, glazing & kiln firing and Postage and Packaging.